Try as he might, director Sam Mendes can't manage to find his way out of suburbia. 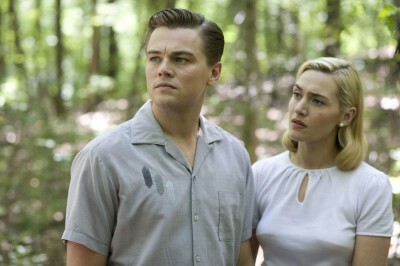 The "American Beauty" filmmaker returns to the cultural cancer in "Revolutionary Road," an extraordinary motion picture that harnesses spellbinding emotional discharge and enthralling disgust, using two of the most talented and captivating stars of today to bring to the screen a masterwork of domestic isolation. It's the best film Mendes has made to date. Trying their best to conform to mid-1950's standards of social grace and marital comfort, Frank (Leonardo DiCaprio) and April Wheeler (Kate Winslet) are coming apart at the seams. With years of growing unrest at home sending April into depression and Frank to infidelity, the couple decides to shake up their life by moving to Paris, to start over with renewed vows of devotion. Spreading the news to friends (David Harbour, Kathryn Hahn) and acquaintances (Kathy Bates), the couple perceives the hesitation of congratulations, amplified when Frank receives a promotion at work and April discovers she's pregnant. With the window of opportunity closing on their European dream, Frank and April turn on each other, powerless to confront and amend their dissatisfaction and fears. The true test of "Road" is the range of melodrama that exists within. Adapted from the beloved novel by Richard Yates and knowing Mendes's predilection for polished hysteria, it makes perfect sense for the film to dwell on the bubbling pot of emotive poison spattering Frank and April, with an eye toward grandstanding professions of marital bile. However, "Road" never goes to a shrill place of obviousness, nor doesn't it attempt to spell out the misery with wild performances and on-the-nose screenwriting. Instead the film is a gorgeously mounted voyage of discomfort, observing the widening dividing line between two people who've lost interest in open communication, forced to preserve a decomposing lifestyle and status in the name of matrimony. The cruelty which pulls Frank and Alice apart is where "Road" hits the hardest. Playing with steadfast gender roles and suburban complacency, "Road" elects the slow burn route, generously exhibiting the erosion of spirit within the two lead characters. Frank and April were brought together by cocktail-hour flirtation and broken promises and now, left to deal with the mess of life, they've declared war, using April's pregnancy and Frank's possible new position at a company he loathes as ammo to unleash horrible diatribes against each other. "Road" is teeming with blistering argumentative situations, but Mendes doesn't allow the unhappiness to blur into white noise. Instead "Road" grips tighter with every row, deepening the characterization as Frank and April confront their boundaries for the first time, coming to the realization that kids, a house in a WASPy neighborhood, and predetermined domestic roles have transformed them into rats trapped inside a cage. "Road" is an actor's paradise and I couldn't imagine a better way to reunite the "Titanic" stars than this caustic drama, a polar opposite affair from the Jack/Rose tragedy. Both DiCaprio and Winslet impart a dire quality with minimal moves, internalizing the remorse and rage with outstanding facial contortions and a nimble running of Justin Haythe's acidic screenplay. DiCaprio and Winslet share blinding chemistry together, making scenes of discord drip with unnerving realism, yet encrusted with intriguing theatricality. The actors throttle the pain carefully, saving themselves for bursts of love and hate, interpreting a marriage built on a fleeting memory of passion that's flown the coop long ago. Supporting work from Michael Shannon twists the knife further. Playing John, the institutionalized son of Bates's realtor character, Shannon adds a unique energy to the film, portraying the only clear thinker of the story: a man entwined in mental illness, yet he's sees Frank and April for who they truly are. With only two sequences to spread himself out in, Shannon enriches the movie with his cracked mischief, prodding the Wheeler discomfort to detonation. As "Road" tightens with anguish, lies, and acts of emotional revenge, Mendes positions the film beautifully to best consume the painful road ahead for Frank and April. With a cast this tight, production credits that evoke a 50's mood with both obvious and subtle characteristics (think cigarettes and internalization aplenty), and a directorial job that can manage the displeasure of marital disagreement and loathing without submerging the intended pitch of sorrow, "Revolutionary Road" reaches a summit of dramatic gratification and pure emotional mutilation that's absolutely riveting.